While an alarm may bring you into the world of the living, it doesn’t really wake you up. Normally it takes about two cups of coffee and a hot shower to make you feel bright-eyed and bushy-tailed. If you have the time to take more than three or four minutes in the shower, it’s a good place to de-stress. The best way to do that is by breathing deeply, and it helps that your shower is essentially a sauna. It does feel a bit strange to just inhale more air than usual. Most prefer to smell something aromatic if they’re trying to relax. The Aromatherapy Shower Set will do just that, and it doesn’t take much hassle to install. This is an arm that has a mounted pod which contains essential oils. You can either place the nozzle in your shower stream, or just outside of it. 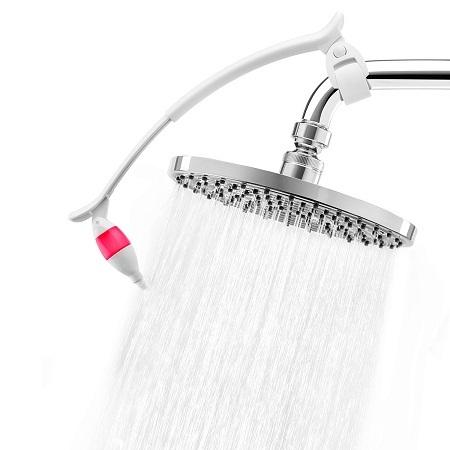 Through the hot water, it will diffuse into your shower, and give you a spa-type experience. This set comes with three pods, “breathe”, which is comprised of Cedarwood Atlas, Peppermint, Lemon and Eucalyptus, “passion”, which has Lavender, Orange Sweet, Palmarosa, Clove, Patchouli and Cinnamon, and “unwind” with Sweet Orange, Bergamot, Petitgrain, Lavender, Patchouli and Vetiver. You’ll want to take the pod down after every shower, as this just drips oil when placed upside down. This will cost you around $45 if this is something that might tickle your fancy.